I am writing to you because you’ve both written columns about the tragic death of Jordan Belliveau, another child “known to the system” in Florida – apparently on the same day. More particularly, I am writing because your columns were not the usual quick-and-dirty “Boy do I hate child abuse!” rants – the kind of column that is filled with scapegoating; the kind that’s really just a cheap and easy way to meet a deadline. On the contrary, the anguish in your columns is real and you both seem seriously interested in answers. Indeed, I first got in touch with you, Ms. Carlton, after you wrote a brave, counterintuitive column on some of these very issues. That was in 2010, a time when Florida child welfare finally was starting to improve. As you may recall, when I wrote to you then, I predicted a backlash against reform. Sadly, that’s exactly what happened. I did not predict that it would be led by the Miami Herald – and the editorial board at the Tampa Bay Times. But that’s also exactly what happened. So the need for bold, counterintuitive thinking is even greater now. I am using the open letter approach because you’re certainly not alone in agonizing over how to fix child welfare in Florida. And I am hoping that your interest in answers includes a willingness to look past the usual failed solutions – just as you did, Ms. Carlton, in 2010. Because those “solutions,” and the false premises that underlie them, are a large part of what has gotten Florida, and much of the country, into this mess in the first place. Among those false premises is one that both of you mention in your columns. That’s understandable, since it is probably the most common misconception in all of child welfare: The idea that family preservation and child safety are inherently at odds – competing interests that somehow have to be “balanced.” The implication, of course, is that if you leave a child in or return a child to a home where abuse or neglect has been alleged, that’s inherently risky. Keep the child in foster care and it may ruin his psyche, but at least he’s physically safe. What I will argue in this long letter is that in the overwhelming majority of cases family preservation isn’t just more humane than foster care, it’s safer than foster care. And the real reason for horrors such as the death of Jordan Belliveau has nothing to do with any supposed “policy of reunifying families at all costs” at Gay Courter, a volunteer “guardian ad litem (what most states call a Court-Appointed Special Advocate (CASA)) claims in a Times op-ed column. On the contrary, it’s almost always because of caseworkers so horribly overloaded with cases of children who don’t need to be in the system that they lack the time to properly investigate any case. As a result, they make terrible mistakes in all directions. Even as they take many children needlessly they leave others in, or return them to, dangerous homes. Those false premises are laid out most clearly in Ms. Courter’s op-ed. Since I’ve followed Florida child welfare for about 30 years now, and NCCPR has issued reports on child welfare dating back to 2000, I am familiar with Ms. Courter’s work. I know that, like most people in child welfare, she has only the best of intentions. I also know that at least one of you has written admiringly about her in the past. I, on the other hand, am that guy who keeps saying those terrible things about the whole approach to child welfare taken by the Times and the Miami Herald. I make no apology for that. When children’s lives are at stake - literally – good intentions aren’t enough. The Times and the Herald didn’t make a good child welfare system bad. But they helped make a bad child welfare system worse – and they helped to halt and reverse what had been the first real improvement in that system in decades. You are in a position to do better. And if you are willing to reconsider old assumptions then you can help break the cycle of tragedy-investigate-repeat that Ms. Carlton aptly described in her column. Though I think Ms. Courter sincerely believes what she is saying, the whole idea that child safety and family preservation are opposites that need to be “balanced,” that child removal equals child safety, and that the system is bending over backwards to keep families together “at all costs” is still the Big Lie of American child welfare. It is that very lie that has contributed to creating a system where tragedies such as Jordan’s death are more likely. In no state is that clearer than Florida. It’s clear both because of what is happening now and because there actually was a time, not that long ago, when Florida was doing significantly better – something I’ll come back to later in this long letter. That same Big Lie was the underlying premise of the 2014 Miami Herald series “Innocents Lost” and earlier work by the same Herald reporter. That’s why my organization created a special website and blog just for Florida to counter the misreporting of the issue by the Herald – and, more recently, the Tampa Bay Times. The site includes a point-by-point rebuttal to Innocents Lost and a detailed discussion of the data on child abuse fatalities that the series omitted. 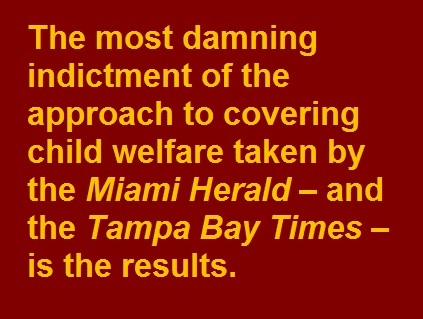 But the most damning indictment of the approach to covering child welfare taken by the – and the Times – is the results. “State steps in less, more children die,” said one headline on a Herald story several years ago. That headline sums up the entire thesis of Herald child welfare coverage. But now the state is stepping in much, much more. The number of children torn from their homes each year has skyrocketed, as has the number trapped in foster care on any given day. Florida is in the midst of a foster-care panic. And it’s at its worst in parts of your region, where children are taken at among the highest rates in the state. What has the panic wrought? ● Children forced to spend their days literally parked – spending hour after hour stuck in cars in a convenience store parking lot. ● Children moving from place to place night after night after night. ● Children torn from parents who are nothing like the mother accused of killing Jordan Belliveau. On the contrary, a representative of the state Attorney General’s office admits that children are taken solely because their families lack housing. But if Courter is right, Florida’s children at least should be vastly safer now than they were a few years ago, and children in your region should be among the safest in Florida. But the one thing you and I and your editorial board and Gay Courter probably can agree on is that they are not. The death of Jordan Belliveau, the kind of case where there were more “red flags” than a Soviet May Day parade, was exactly the sort that the Herald told us would stop if Florida just stopped supposedly putting “family preservation” ahead of “child safety.” DCF did exactly what the Herald – and your editorial board, and Gay Courter – told it to do. But things only got worse. The state report found that child safety had declined. All that suffering inflicted on all those children who were taken needlessly, and all those children who now must sleep in a different home each night and wait in cars by day -- all of it has been for nothing. That’s because there is no Vast Family Preservation Conspiracy – and there never was. The real reasons for tragedies such as the death of Jordan Belliveau are those far more mundane reasons I mentioned at the start of this letter, reasons that involve an overloaded system. A foster-care panic only overloads the system more. So everyone makes even more mistakes – in all directions. “Man up and protect children first,” says Courter – by which she means take away even more of them and reunite even fewer of them. But nothing is less courageous than a foster-care panic. The caseworkers who rush to take the child and run aren’t protecting children they’re protecting themselves – as the state’s own report makes clear. It’s hard to blame them. But I blame Courter for encouraging it, and confusing such behavior with courage. When WFLA-TV first exposed the fact that children were spending their days stuck in cars, I saw no outraged op-ed from Gay Courter. When WFLA-TV reported on how the state admitted it’s tearing apart families solely because of lack of housing, I saw no outraged op-ed from Gay Courter. And, most telling, when WFLA-TV reported on the tragic death of Kwon McGee, I saw no outraged op-ed from Gay Courter. Tell me honestly: When I mentioned Kwon McGee in the paragraph above, did you immediately know the name? Does it ring a bell even now? I don’t blame you if it doesn’t. But I do blame whoever it was among your editors who did not think the story of an infant taken from his mother solely because she was homeless – only to die in foster care – was worth even one story in the Tampa Bay Times. Perhaps I missed it. But I could find no news story. No outraged editorial. No columns. No op-ed from Gay Courter – or anyone else. 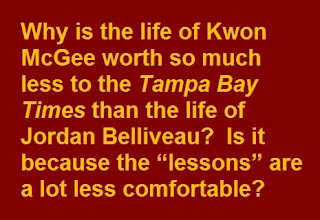 Why is the life of Kwon McGee worth so much less to the Tampa Bay Times than the life of Jordan Belliveau? Is it because the "lessons" are a lot less comfortable? And when Gay Courter writes that she knows “Jordan is not an exception!” because she has seen other cases and that supposedly proves a bias in favor of keeping children in their own homes, what does the case of Kwon McGee prove? That’s the problem with policy-by-horror-stories. We can trade such stories endlessly. When Courter picks the ones that suit her point of view and suggests they prove something, it’s like saying that global warming is a hoax because it’s cold where I live. It is the ultimate example of the tyranny of personal experience. When anecdotes collide, it’s time to look at the data – from the nation as a whole, and also from Florida. Courter speculates that for every child who dies there are vastly more enduring enormous suffering by being left in their own homes. What she doesn’t tell you is that actual research shows that in typical cases, not the horror stories, children left in their own homes fare better in later life even than comparably-maltreated children placed in foster care. There are at least five such studies, all involving direct comparisons and actual real-life outcomes – and two of the studies, from MIT, are massive in size and scope. In contrast, when it comes to actual research on outcomes in typical cases, Courter cites exactly none. The research findings are not as surprising as they may seem. Because the typical cases are nothing like the horror stories. Far more common are cases in which family poverty is confused with “neglect” such as the case of Kwon McGee and the cases cited by the Attorney General’s office. Other cases fall between the extremes. When such children are needlessly thrown into foster care, they lose not only mom and dad but often brothers, sisters, aunts, uncles, grandparents, teachers, friends and classmates. They are cut loose from everyone loving and familiar. For a young enough child it’s an experience akin to a kidnapping. Other children feel they must have done something terribly wrong and now they are being punished. But then, we should all know that by now, after what we’ve seen at the Mexican border. The motivation of DCF workers is, of course, vastly different. But the suffering caused by needless removal is exactly the same. All that harm occurs even when the foster home is a good one. The majority are. But the rate of abuse in foster care is far higher than generally realized and far higher than in the general population. Multiple studies have found abuse in one-quarter to one-third of foster homes. The rate of abuse in group homes and institutions is even worse. But even that isn’t the worst of it. The worst is what I mentioned earlier: All those workers too overwhelmed with false allegations, trivial cases and children who don’t need to be in foster care, to find children in real danger. So the approach advocated by the Herald – and your editorial board – and the approach upon which Gay Courter actually wants to double down is an approach that makes all children less safe. There actually was a time when Florida understood this. It was that time when Bob Butterworth and George Sheldon were running DCF. They significantly curbed the misuse and overuse of foster care. In the process they did not end the horror stories – no child welfare leader anywhere in America has done that. But they did improve child safety. And again, that’s not anecdote – that’s research, specifically independent evaluations. It was a record so impressive it got the attention of The New York Times. But it was a record the Herald distorted and then ignored. Curbing needless foster care while improving child safety was among the achievements of which Sheldon was most proud. But after his recent death, a 2,300 word Herald obituary made no mention of it. In an Orwellian twist, it was simply sent down the “memory hole.” Because this real success contradicted the Herald’s “master narrative” about child welfare, the Herald had to pretend the success never happened. A theme in both of your columns can be boiled down to: Why don’t we just listen to the guardian ad litem (CASA, for those not living in Florida) in these cases because, after all, that’s supposedly the only person who cares only about the child. Before I discuss that premise, let me introduce you to someone who used to be approximately the equivalent of a GAL. Her name is Crystal Baker-Burr and she works in New York City, where they do things a little differently. Right now, Baker-Burr represents parents. But before that she worked for the Legal Aid Society Juvenile Rights Project – they’re the ones who represent children in child abuse and neglect cases. In New York this is done by trained professionals, not volunteers. And if that makes you want to stop reading this letter (assuming you’ve gotten this far) and go straight to her full column, by all means go ahead. OK, now that you’re back, let me introduce you to a very different sort of former GAL. His name is Merlin Sprague and his comments about the families he’s seen might appall even Donald Trump. Have a look. So, now that you’ve met Mr. Sprague and Ms. Baker-Burr, I’m sure you see the problem with the GAL = God approach. Give the same set of cases to Gay Courter and Merlin Sprague and Crystal Baker-Burr and odds are they will reach very different conclusions about most of them. And while, personally, I’d love to see courts always defer to someone like Ms. Baker-Burr, a GAL = God approach also would mean always deferring to Merlin Sprague. Is that really what you want? So no, we can’t just dispense with courts and caseworkers and everyone else and just say: Do whatever the GAL says. (No you didn’t literally recommend that, but you came pretty close.) We need to do it the old-fashioned way: All sides should have high-quality professional legal counsel making the best possible case for the outcome sought by their clients. And then the one person who is really supposed to be objective – the judge – makes a ruling. Sometimes those judges will get it wrong, send a child home and tragedy will follow. Other times – and the data show this is far more common – the judge will rubber-stamp whatever DCF wants. Then, too, tragedy will result. Remember, a judge approved removing Kwon McGee from his home. But we also know a few things about the effectiveness of what Florida calls GALs based on, yes, data. The most comprehensive study ever done, one commissioned by the National CASA Association itself, found that they do not, in fact, make children safer. What they do is prolong foster care and reduce the chances that children will be placed with relatives instead of strangers. We also know this: The fact that a GAL has no vested interest is not the same thing as having no bias. On the contrary, for reasons discussed here and here, GALs are among those most likely to bring strong personal biases to their work – biases that revolve around race and class – biases that help explain the findings from the research. And, indeed, this is reflected in a disturbing track record across the country. How to we break this cycle of failure? How can we create a system that doesn’t demand that columnists write that same column over and over? It can be done. But you’ll need to question a lot of assumptions. Journalists and caseworkers and GALs tend to have similar backgrounds and experiences. In every newsroom there is probably at least one reporter or editor who has a friend who’s a foster parent, or an adoptive parent or maybe a caseworker or a friend of a caseworker – or a GAL. It’s almost unheard-of for reporters to know children who were taken from their parents unjustly, or to know those parents – except, perhaps, as story subjects. So it’s a lot harder to imagine walking in their shoes. So, if you have not done so in the past, I hope you will seek them out. Where? It’s harder in Florida than in, say New York City, where most families get high-quality defense counsel. Florida is one of those places where, sometimes, even parents’ own court-appointed lawyers feel only contempt for them. But you might get somewhere by reaching out to civil rights groups, or groups that deal with issues relating to poverty. A representative of the Attorney General’s office says children are being taken away because their parents lack housing. Surely it’s possible to find some of those families. You might have to look beyond Florida. You could do what the Arizona Daily Star recently did and go all over the country looking for best practices. (Newsroom budgets being what they are, I imagine you might have to do it by phone.) You could start in the same place the Herald actually cited in Innocents Lost as a model for doing child welfare right: Alabama. But, in another Orwellian twist, the Herald never explained that the reason for Alabama’s relative success in improving child safety is that it rebuilt its system to do far more to keep families together. The Herald never told readers that Alabama takes away children at a far lower rate than Florida – and they did it all while actually spending even less, proportionately, than Florida. The Herald story about Alabama never quotes the people who actually led the transformation of the system. Either the reporters never contacted them or, more likely, they didn’t like what they heard, so they left it out. I’d be glad to put you in touch with them; one of them is a member of my group’s Board of Directors. Fortunately, The New York Times didn’t make the Herald’s mistake in its excellent account of how Alabama transformed. The Arizona Daily Star also got it right. Tell the stories that the Herald refused to tell – and that, so far, the Tampa Bay Times has refused to tell as well. 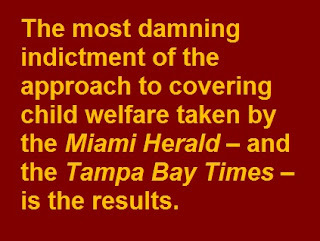 Break away from the “master narrative” that has constricted most child welfare reporting – and almost all such reporting in Florida. Do that, and maybe, in a few years, you won’t have to write the same column you’ve written so many times before.